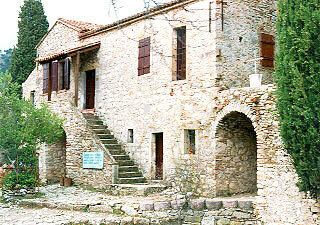 The building where the museum is housed, is an old two - storied cell situated NW of the main church of the Monastery. It has been restored during the early 80's thanks to a donation from Mr Chandris, through the 'Greek Society'. The museum is installed in the upper floor of the building, which consists of two continuous rooms for the exhibition and one small room for the guards. At the ground floor there is a small oratory and a store room. W.C. facilities have been arranged at the back of the museum. Because of the pillage that the Monastery suffered by the Turks during the massacres of Chios at 1822, the items exhibited are not numerous and date mostly after that time. Among them, post-Byzantine icons, ecclesiastical silverworks, ecclesiastical and popular embroideries and woven textiles are included. The most important item is the 'Pefki', a silk woven with gold and silver threads curtain, with stylized floral motives. According to the woven dedicatory inscription, it was made by chian craftsmen for the Monastery of Nea Moni, in 1742. Its original use is uncertain.